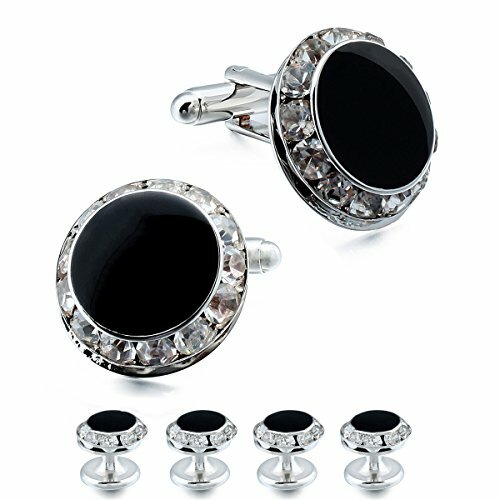 HAWSON Pretty Black Enamel Crystal Tuxedo Shirt Studs and Cufflinks Set for Wedding . Gold Plated Base Copper Black Enamel Shirt Studs Set. Cufflinks?20MM?Studs:11MM,Weight?23g,Packing with A Deluxe Gift Box. Great One by One Quality Controlled . Graceful Crystal Make you Outstanding. ; Well Polish, Color Never Fade. Flexible Closure, Easy to Put On and Won't Slide Out. Perfect for Wedding,Business, Party and Banquet. Best Gift for Groom,Husband,Boyfriend.